With a little planning, your garden can have flower blooms almost all year long. Unlike annuals that bloom consistently over many months, perennials generally have a window of time when they bloom. So, many beginner gardeners find it difficult to create a colorful 4-season garden using just perennials. The biggest struggles I’ve heard are that the garden just looks green, there’s not enough color or things feel too bland. But, having a low-maintenance perennial border doesn’t have to be this way. There are several ways to increase a flower’s bloom time and frequency. In this post I’ll go over a few ways to create long seasons of bloom with perennials that will come back year to year. With a little planning, you’ll be able to enjoy your perennial garden with very little effort. And it will reward you year after year with beautiful blooms and four seasons of color! This may seem like common sense, but I find that many beginner gardeners tend to choose plants that are flowering when they visit the garden center without much thought of what that flower or plant looks like the rest of the year. While it’s ok to choose a few beautiful flowers or plants that have a short bloom period, I encourage you to fill your garden with perennials that bloom with color for longer periods of time. What perennials bloom all season? 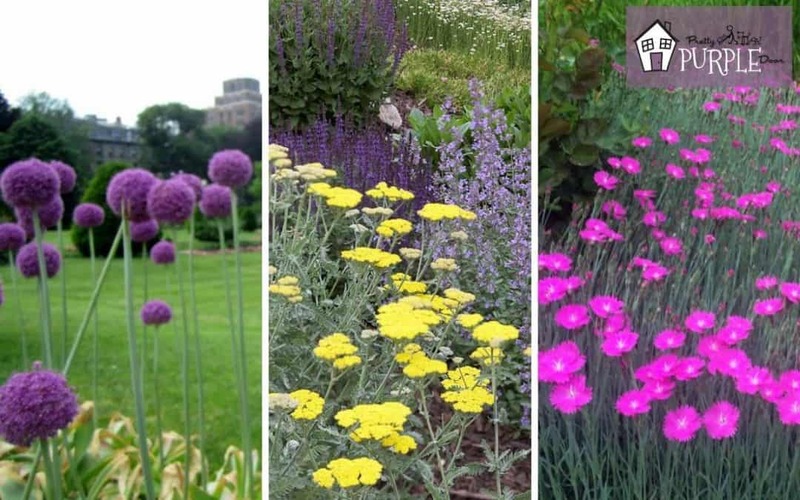 Wondering which perennials bloom all season long? A few of my favorites are daylilies, salvias and knockout rose bushes. All three of these plants will bloom throughout the entire summer with little to no effort on your part. You’ll find a lot more of my favorites in my post about perennial plants and flowers for mixed borders. This is a little more maintenance than I care to deal with, but it’s a known fact that deadheading your flowers after they bloom will encourage your perennials to bloom again. Deadheading is very simple. As plants fade out of bloom, pinch or cut off the flower stem below the spent flower and just above the first set of full, healthy leaves. Repeat with all the dead flowers on the plant. Deadhead early and often. With just a little effort, you’ll be enjoying more blooms and even extended bloom times. A few plants to try deadheading with are shasta daisies, salvia, bleeding hearts, knockout roses and coneflowers. Fertilizing your perennials so they have proper nutrition is another way to extend the length of bloom time. I wrote a post about soil improvement tips that will help you get started with fertilizing. I have a very simple regiment to replenish my soil each spring and fall. In the spring, I add 1-2” of organic matter to my garden beds. And, in the fall I sprinkle my beds with some bone meal to replace nutrients and get my plants ready for winter. Don’t overdo this – About a tablespoon of bone meal is enough fertilizer for 1×1 sq ft, such as a large planter pot. What kind of fertilizer makes flowers bloom? Visit a local gardening center in spring and you will find a myriad of perennial plants all in full flower. If you were to purchase a selection of these and plant them at home, chances are you would have lots of flowers for a few weeks or so. But, when summer rolls around your landscape will not have much interest. That’s because for the most part, the showiest, most eye-catching plants in the nursery are for sale during their peak bloom time. So how can you avoid this? Easy. Visit the garden center multiple times a year (like you need an excuse!). In all seriousness, making multiple visits to the garden center will allow you to see different plants that bloom that time of year. Visiting the garden center in each season will help you to design a garden that has blooming interest in every season! Did you know that some of your favorite perennials have multiple varieties? It’s true… and these varieties often times will bloom at different times of the year. So, using a mixture of different cultivars of the same plant or flower is a great way to extend the bloom sequence of your favorites over longer period of time. This is an easily overlooked tactic to use in your own garden. If you’re familiar with alliums, you likely think of them as an easy-to-grow summer bulb. But, there’s actually varieties of alliums that will keep the blooms coming right up to the first frost. Start off the season with Purple sensation alliums (Zones 2-10) that begin blooming with the late daffodils and tulips. For late spring to early summer, plant some Gladiator alliums (Zones 3-8) near the back of your border. They grow on 3-4’ tall stalks with-6-inch-diameter flowers. In the summer, Circle (or curly) onions (Zones 4–9) have blue-green leaves with a corkscrew effect. They are a cool variety to try in Japanese-style gardens, rock gardens or the front of your mixed border. With just three allium varieties, you can enjoy your favorite flower from early spring to late summer! Who doesn’t want a garden with flowers that bloom each and every season of the year? There are several things that you can do to make this happen. First, choose really long-blooming perennials like knockout roses, salvia and daylily. Make sure that you give your perennials the proper nutrients by fertilizing. The little bit of extra effort to deadhead your blooms after they die off will also promote longer bloom times for your favorite plants and flowers. Don’t forget to visit your local garden center multiple times a year so that you can ensure you’re buying plants that will bloom in different seasons. Finally, you can choose different varieties of your favorite flowers and plants in order to make it feel like they are blooming for longer periods of time. I love to do this with alliums.